This easy and quick pasta dish is a guaranteed way to get picky eaters to love their broccoli, just roast it with garlic and olive oil! The aroma of the roasted garlic always conjures up the question, is dinner ready? This is one of my favorite pasta dishes, great for those nights you forget to defrost your something, or if you need to whip up a quick inexpensive yet healthy meal. Reserving some of your pasta water before you drain it, to add to the pasta after it’s tossed with the broccoli is my way of keeping the pasta from getting too dry, without having to add more olive oil. Adding crushed red pepper is also delicious if you like it a little spicy. Enjoy! In a baking dish combine broccoli, olive oil, garlic, salt and pepper. Roast broccoli about 20 minutes, tossing half way, until broccoli is browned and tender. Meanwhile, boil salted water in a large pot. Before draining, reserve 1 cup of the water from the pasta. 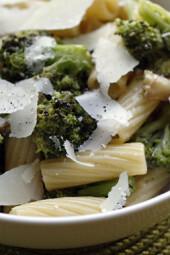 Drain and toss pasta with broccoli. Add 1/2 cup reserved pasta water (or more if necessary), Pecorino Romano, salt and pepper to taste. 8 oz. does not four serving make – at least not in this house. More like 1.5. I will be roasting up 2 lbs of bloc with a pound of shells. It will serve me, one guest and (maybe) a bit of leftovers. This was a delicious and super fast dinner! I used corn pasta since we are trying to avoid the "real stuff." The nutty broccoli flavor paired perfectly! 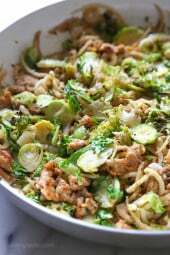 Definitely making this a staple weeknight meal in my house! Do you think there's a way to roasted the vegetables ahead of time? I'm feeding a crowd and am trying to keep the number of dishes to a minimum. We've made this a couple of times now and love it!! Last night, I reduced the amount of pasta and added in a pound of halved baby bella mushrooms, which I roasted with the broccoli & garlic. It was so good! Amazing and extremely easy to make on a night you just don't want to cook! We sliced 2 lemons and added the slices to the pan when roasting the broccoli. The lemon added a nice flavor. Next time we might try to add boneless chicken breast. Awesome! This was incredibly easy and so tasty! Can't wait to make it again! Used whole wheat spaghetti noodles instead. added the red pepper flakes. DELICIOUS!!! I halved the recipe and added a chicken sausage that I had left over from another recipe. I really like the texture of the broccoli. Thanks, Gina! Love all vegetables roasted! Never thought about smashing garlic and roasting with. Can not wait to try this! Wow is all I have to say, so delicious and easy, my new favorite! So simple and so delicious. I don't think I'll ever boil broccoli again…it's just so good roasted! Reserved pasta water is my solution for replacing all the olive oil! 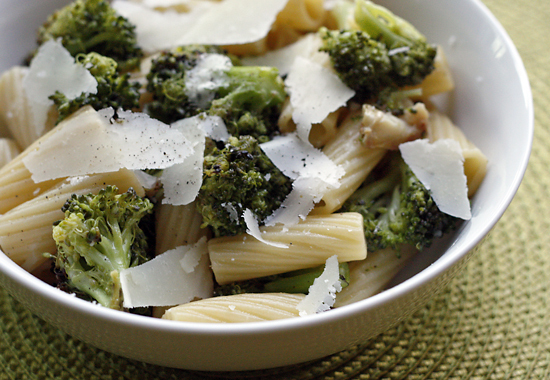 pasta broccoli is one of our favorite meals. the only problem is that when my grandmother makes it, she uses tons of oil. i made this tonight and it was absolutely delicious! my daughter loved it. i am so happy to be able to eat pasta broccoli again! :) thank you so much!!! Made this tonite- it turned out really, really. I added some roasted red pepper (for color) halfway through the roasting and it was WONDERUL! Thanks, Gina! I make a similar dish but add a generous amount of red pepper flakes to give it more flavor. yes, a serving size for pasta should be 2 oz. 2 oz should be about 1 cup cooked (4 cups total), and it should be about 4 cups of broccoli which would give you about 2 cups pp. Of course, if you want more pasta, maybe add another 2 oz. Hi Gina. I made this for dinner tonight and loved it. Just one question though. Is the 8 oz of pasta right? I figured out the points (old points system) and it was less then what you had here and I did not feel that it was enough pasta. Each serving was only about 1 1/2 cups each and you said it should be around 2. Just wanted to make sure I made it right. I made this for my family last night & we loved it!! Just the broccoli alone was to DIE for so tonite, since I have some broccoli left over, I'm going to make it the same way as a side dish! Thank you! @Amy- we are almost neighbors! @Mandy- I hope the kids like it! My daughter loves this. And she's pretty picky. Making this tonight! It looks delish! I'll have to coax my kids to try it, but if I can I think they'll like it. Just found this blog and planning my whole menu around it. 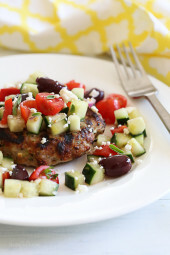 Finally WW recipes that are more gourmet and satisfying. Thanks for sharing! I made this for dinner last night and it was yuuummmyyyy! My boyfriend was amazed with my cooking skills because I have never been a cook. 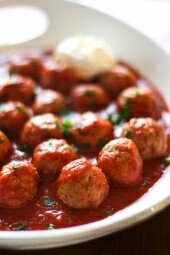 I just signed up for Weight Watchers and I'm using your blog for yummy recipes. I will always link your recipes I use and blog about to your blog! I made the rice cripsy treats last night too:) MMMMMMM! Thank you for all your recipe ideas. I will be a regular reader!!! @Amy, thanks for the tip! @Ashpea, You're welcome, happy you enjoyed it! I made this for dinner and it was amazing! I am so happy I found your blog over the weekend..you have restored my faith in my journey to lose weight! I am so happy to find an amazing cook who counts points! THANK YOU!!!! I made this today to eat for lunches this week. Easy way to do the garlic: split a whole bulb up into cloves, leaving papery skin in tact. Toss it in with the broccoli (I counted the cloves to be sure I didn't miss any at the end). When done roasting, squeeze the garlic out of the skin and smash it right in the baking dish then mix it up with the veggies. I used whole wheat pasta, only 2 tsp EVOO and no cheese (5 pts). I also had leftover onions/peppers from last night's fajitas that I threw in with the broccoli too. Ooh, I do love roasted broccoli! This looks delicious! Thanks for this great recipe, I was looking for something different and this turned out great for dinner. I added some grilled chicken – it was delicious. (I did use frozen because that's all I had on hand). @Kristi- I wouldn't use frozen, fresh is so much better for this! @Me N monkeys- Thank you! i have an Award waiting for you over on my blog! Can I use frozen broccoli florets? Looks DELISH! My 'picky eater' kids eat pasta, broccoli, parm cheese, anything smothered in garlic, and not a whole lot else. I *think* I may have to try this one. 🙂 Thanks!! made it last night and it was a hit! super quick and easy to make & my 3 year old devoured it, he is a notorious picky eater! Great idea! I'll have to try it. Serving size is almost two cups! @Karina- I love gluten free brown rice pasta! It taste just like regular pasta. @Susan, yes, red pepper flakes are great here! Just made this for lunch. It was FAST to make and it is SOOOOOO delicious. The red pepper flake is such a nice addition to this dish. Thanks for yet another terrific and easy recipe! Would a serving size be about a cup? I love a simple pasta dish like this.Really enjoying your blog a great deal! Thank you! Switch out the pasta with gluten-free brown rice pasta and I am so there! I love a simple pasta dish like this. Perfect for a busy weeknight. YUM!!!! I love broccoli and I ADORE pasta, but I've been staying away from my noodle love. 7 pts? HECK yeah! !